Join APA Los Angeles’ Young & Emerging Planning Professionals (YEPP) on Saturday April 23 to participate in FoLAR’s Great LA River CleanUp. 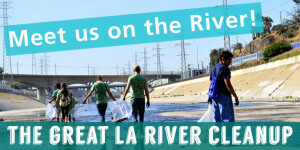 Celebrate Earth Month by helping to clean up the Los Angeles River with your APA Los Angeles community. There is an especial need for CleanUp volunteers this year because of the increased amount of trash in the River due to El Niño storms. Please contact Clare Kelley at clare.harmer.kelley@nullgmail.com if you are interested in participating in the CleanUp. Visit https://folar.org/cleanup/ for more information.